Why not enjoy a beautiful Jacaranda tree view in your sky panel? The Jacaranda tree is native to tropical regions like Mexico, Central America, and the Bahamas, but has been introduced widely in Asia, southern California, Florida, and many other places. It’s clear to see why! The flowers of the Jacaranda tree are celebrated around the world for their intense displays of color. The purple flowers against a beautiful blue sky brings the outdoors right into your home or office. 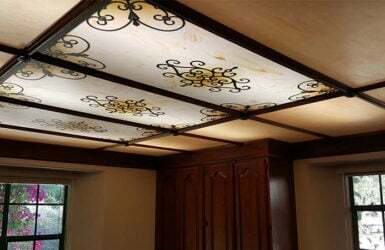 Our customers are often surprised by how vivid the colors are and how realistic the decorative panel looks—like they’re actually looking up through a skylight under the meandering branches of the Jacaranda tree. You and your visitors will feel soothed and enchanted by these rich colors. 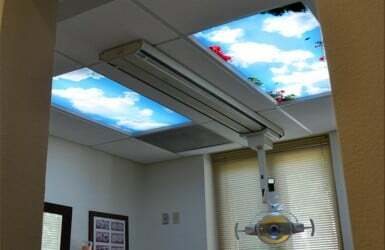 If you’re ready to replace harsh fluorescent lighting with a fresh look, consider this beautiful sky panel handcrafted by Fluorescent Gallery artists. SkyView – A Splash of Purple is available in 46½ x 22¼, 47¾ x 23¾, and custom sizes. Choose from 3 different options. Easy to install. You can install each panel in under 10 minutes. Custom fit. Covers can be custom sized to fit your needs – no trimming required. Improve lighting. 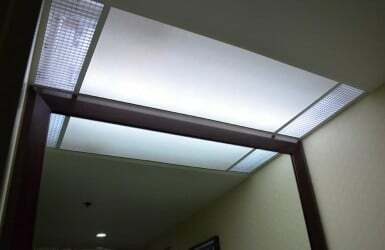 Soften harsh fluorescent light evenly to decrease stress, improve mood, and boost productivity. Realistic design. Patented sky cloud designs help create a realistic wide open outdoor feeling. Durable materials. Handcrafted from premium acrylic that will never deteriorate, become brittle, or turn yellow. Residential uses. Perfect for home kitchens, bathrooms and basement remodels. Commercial cost-savings. 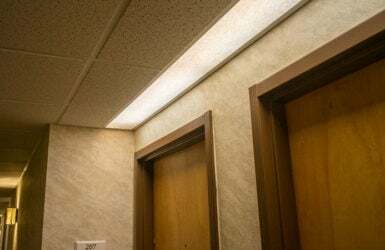 Cost effective lighting solution for hotels, hospitals, doctor’s offices, schools, churches and other commercial spaces. Secure shipping. Premium protected shipping to ensure your panel arrives intact and undamaged. Stunning!. Such a beautiful colour. It’s very beautiful. The staff and patients love it. We are very happy with our light panel. The colors are bright, the images are crisp and clear and the size we special ordered was a perfect fit.